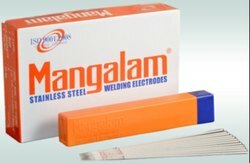 Prominent & Leading Manufacturer from Vasai, we offer mangalam ss 308l welding electrode. Rutile type extra low carboon electrode for welding of AISI 304L, 308L, 321 & 347 Stainless Steel. Weld metal has good ductility & resistant to cracking & oxidation. Looking for Mangalam SS Welding Electrode ?